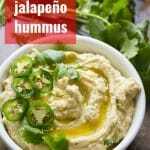 Jalapeño peppers take the flavor of this creamy hummus to the next level! The trick: roast the peppers to bring out their flavor while mellowing the heat. One bite and you won’t be able to stop! My first attempt at cooking with jalapeño peppers, or any form of hot pepper for that matter, ended in disaster. The food turned out delicious. I can’t remember what it was, but I’m sure it was delicious. The disaster part pertains to the agony I experienced throughout the rest of the day. My hands, face, eyes and nose all sizzled away. This had nothing to do with me eating the peppers, but just from touching them while cooking. See, the thing about hot pepper burns is this: they sneak up on you. So by the time you realize you’ve got a problem, you’ve already been handling the peppers for a good ten or fifteen minutes, so you know things are only going to get worse. On that particular occasion I also developed some annoying sneezing and eye burning, which of course drove me to start rubbing my eyes and blowing my nose, only leading to the juices burning my hands to end up in my eyes and nose as well. It was really bad. I remember thinking the meal was fantastic but being absolutely miserable while eating it. Even though this hummus is made with jalapeños, the very pepper that caused me so much misery, it’s not all that spicy (unless you use super spicy peppers — see my notes below!). Briefly popping the peppers under the broiler mellows them out a bit, so you get a little heat, and tons of flavor. After broiling, let the peppers cool for a bit, and then remove the skins. They should come off easily. 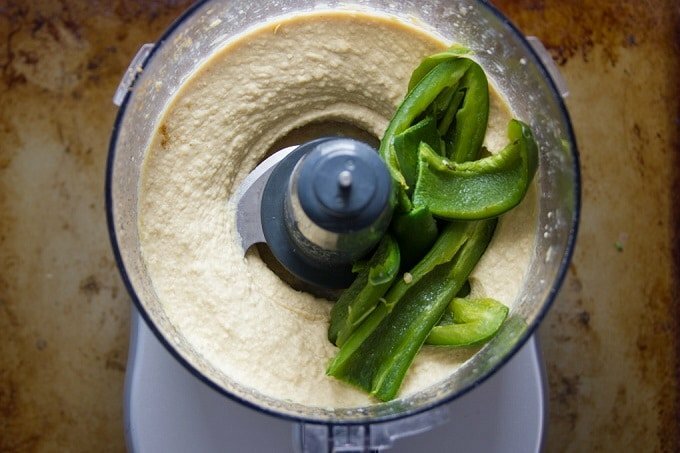 While the peppers cool, blend up your hummus. 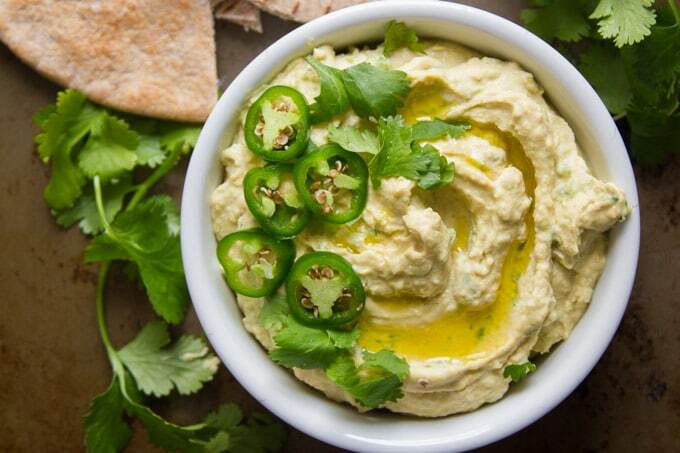 This hummus uses lime juice instead of lemon, because it goes so well with the jalapeño flavor. Add the peppers and blend again. You can keep them chunky or blend until smooth. Grab some pita bread or chips, and dig in! Let my experience serve as a cautionary tale: wear gloves when prepping your peppers. 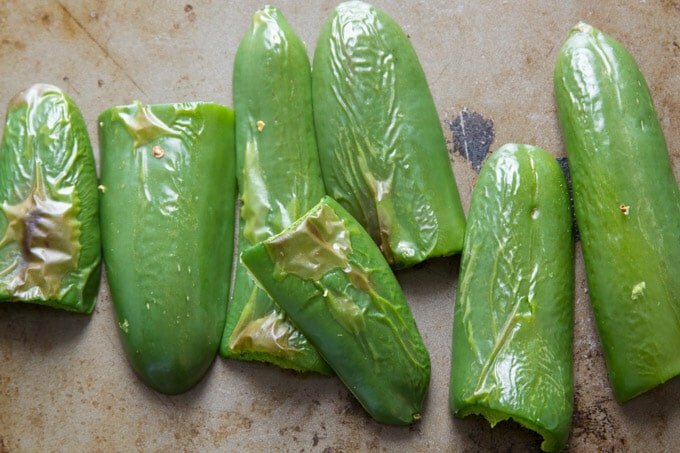 The heat level of jalapeño peppers can range from super mild, to super spicy, and it can be tough to tell where any given pepper falls on the spectrum. Some say that the age of the pepper is a good indicator, with the peppers growing hotter as they get older. Hotter peppers also tend to have a more intense smell. And if you’re up for it, dab the pepper on your tongue and see if it burns. For extra heat, blend a raw pepper into your hummus. 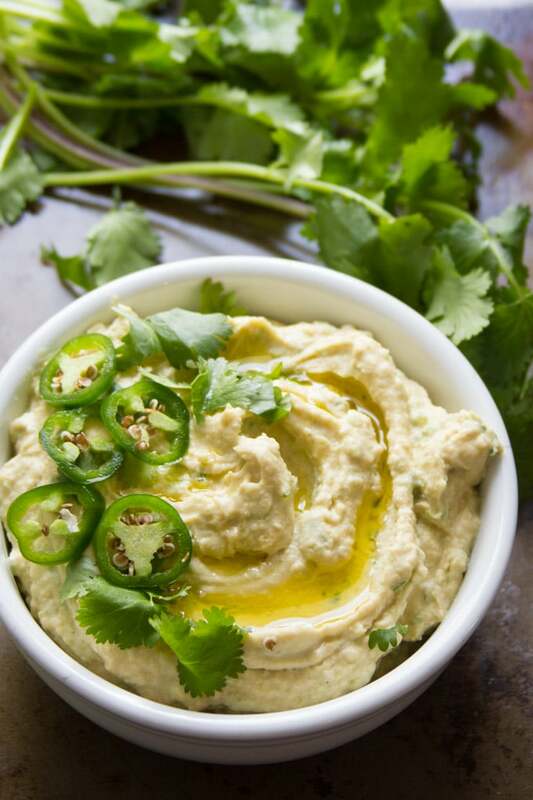 Jalapeño peppers take the flavor of this creamy hummus to the next level! The trick: roast the peppers to bring out their flavor while mellowing the heat. One bite and you won't be able to stop! Put on gloves. Cut the peppers in half, and remove stems and seeds. Place the pepper halves on a baking sheet, skin sides up, and place them under the broiler. Broil the peppers for 5-10 minutes, watching them closely and checking frequently to avoid burning. Remove the baking sheet from under the broiler when skins start to bubble. Set it aside to allow the peppers to cool while you get everything else together. 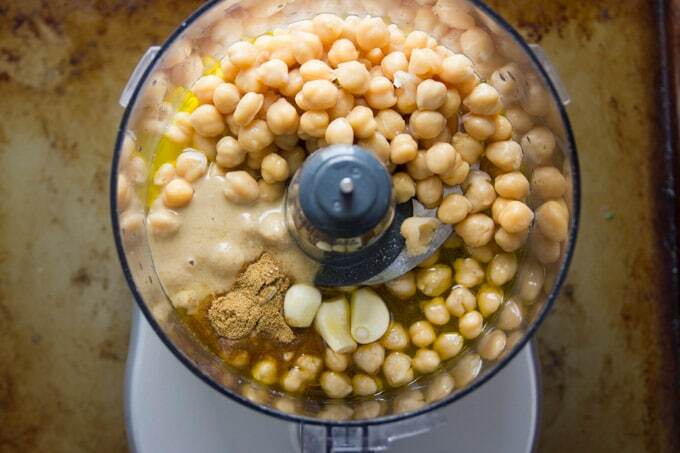 Place all other ingredients into a food processor bowl and process until smooth and creamy. Remove the skins from the peppers once they are cool enough to handle. This should be pretty easy after roasting. 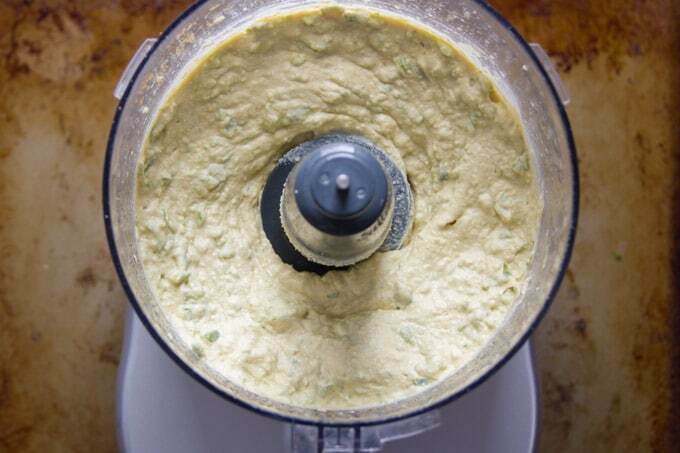 Add the jalapeños to the food processor and pulse until peppers are chunky and distributed throughout the hummus. Serve with pita bread or tortilla chips. Yum! 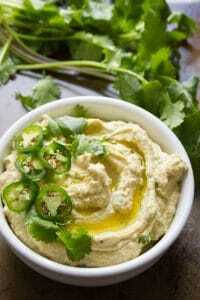 I love spicy hummus, this looks wonderful! Me too! I’ve tried a few other variations on the spicy hummus theme – using different peppers and what not, but this one is by far my favorite. Thanks Kelly! Best hummus I’ve ever had! 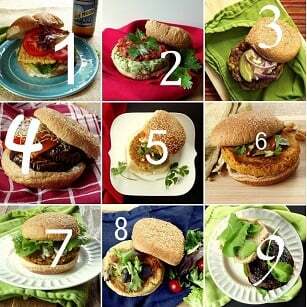 Don’t skip the cilantro! Woo hoo! I’m so happy to hear that! Thanks Linda!